I got my copy of Saidaioujou last week, and I've been exploring the different modes and game systems a bit each day. Unfortunately the port is rather buggy as-is, but a patch is coming in the next week or two that will fix all of the problems. Arcade HD: This is a really faithful port of a challenging, fun game that is flawed by a scoring bug ("overflow bug", as it is called). The port gives an option to fix this, which is great, but there are no separate leaderboards for "fixed" scores, which is not great. 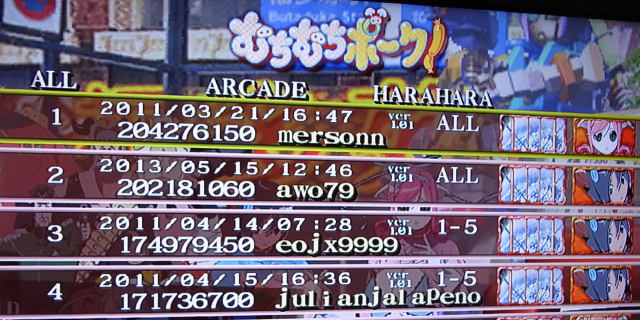 It reminds me of the lack of leaderboards to distinguish between 1.00 and 1.01 scores in Muchi Muchi Pork. Overall this mode feels like Mushihimesama Futari 1.0(1). A tough game light on score, with the scoring system not fully fleshed out. I've cleared it with the bonus character Saya (Type D), but I'm still working on clearing it with a "normal" character. I'm mainly playing as A-Shot, though I also like C-Laser. I can get to stage 5 regularly at the moment. Expert type is very challenging, and not something I intend to delve into any time soon. Ver 1.5: The definitive version of Dodonpachi Saidaioujou. It's quite a shame that this never got an arcade release, but hopefully top players will score attack it in the port. It fixes the overflow bug, makes hypers charge quicker, and makes it much easier to restock hypers right as you end a hyper. This makes previously somewhat mundane sections of stages much more enjoyable, as you can plan out new hyper-based scoring routes instead of just non-hyper chaining. There are numerous other tweaks in the mode as well. Novice: I have to say this is quite a nice Novice mode. Perhaps the best in any Cave game to date, though the recent Mushihimesama X360 port had a good one too. In Shot and Laser types, the difficulty is on par with Mushihimesama Futari Ver 1.5 or BL Original mode, but without the harsh increase in bullet speed in the later levels. Expert type is on par with a typical Cave Maniac-type mode. I think a lot of people will gravitate to this mode, as they may find Arcade or 1.5 too overwhelming in regard to difficulty. Xbox 360 mode: A sort of interesting arrange mode. You can do a double attack as in Daifukkatsu Black Label (hold Shot+Laser), which instead of increasing a rank gauge, decreases a numerical gauge in the upper right (which starts at 10,000). You have a life/bomb gauge at the bottom of the screen. Both gauges are connected, so if one goes down, the other one does as well. You get them to increase by collecting star items during a hyper. Pretty fun, for awhile, but I wish you could play as the other 3 ships instead of just the new one. Notes: The current GP bonus is added to the values of each base value. In Ver 1.5 the current hit count x10 is also added to this value. Ver 1.5: The point value is calculated by 2222 x (Rank/5 + 1) x Bomb Maximum Level. This is added to your score at every 1 frame, regardless of Bomb Maximum Level. So, for example, if you are at Bomb Maximum Level 2 and your rank is 8, your bonus per frame is 2222 x (8/5 + 1=2.6) x 2, which is 11,554 points per frame. Arcade HD: The hyper gauge increases based on the value of your hit count when you collect a bee. Each 50 hits increases the gauge by 1%, up to a maximum of 30% per bee. When you collect the last bee in a stage, you get a 100% bonus on top of this (which equals one extra hyper level). Ver 1.5: The hyper gauge increases based on the value of your hit count when you collect a bee. Each 200 hits increases the gauge by 1%, up to a maximum of 100% per bee. When you collect the last bee in a stage, you get a 100% bonus on top of this (which equals one extra hyper level). Also, when you get perfect bees for a stage the last bee's value is doubled. -In Ver 1.5, Rank plays a role in the amount of hyper gauge increase per star item: at Rank 50 the gauge increases are 1.5 times that of Rank 0. -Enemy point values are different across all 3 modes. -You can't score on or milk bosses in any mode. -Hit count does not affect hyper gauge increases while using the laser in 360 mode. -Novice is the same as Arcade HD in all matters discussed above. I played a few credits of 1.01 with Ikuo today, for the first time since I got my previous Ikuo score, and got a new PB of 425,628,890. Unfortunately, my first loop was quite poor in this run, ending with just 212 million due to a couple costly chain breaks. In my previous 420 million run I got 224 million in the first loop. The second loop was much better in this run, though there were a few chain breaks in there as well. Anyway, 440+mil is looking more possible to me with a ~225 mil first loop, so I'll set that as my new goal. I was very happy to meet my goal of a 400+mil ALL with Momo in Ver 1.01 today, with a score of 401,002,380. The last boss is very difficult to score on with Momo due to her weak lard attack, and I just barely scraped through the last phase with a very lucky dodge with no lives or bombs left. Scoring with the lard attack at the end was just enough to push me over the 400 million barrier. I also got a higher score in DFK BL with B-Strong last week, somewhere in the 470 billion range, I think (it's on the xbox live leaderboards). 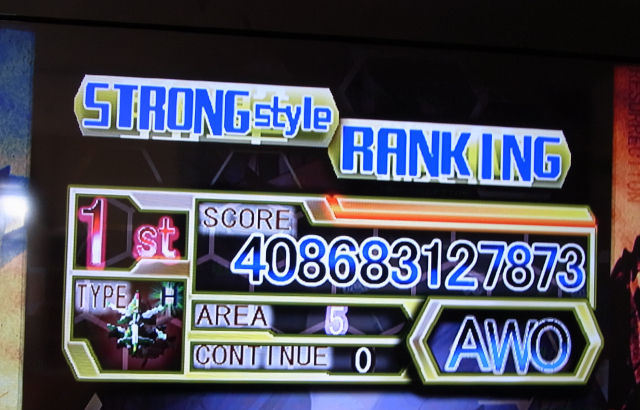 I do enjoy that mode but Stage 5 is such a pain, I'm not sure I'll devote enough time to it to clear it. We'll see. I've been dabbling in a variety of other games as well, but Dodonpachi Saidaioujou will be released tomorrow, so I imagine when my copy arrives (hopefully early next week, if not sooner) I will focus on that, and if the scoring strikes my fancy, I'll play it for a good amount of time. 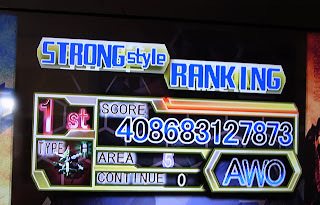 Today I practiced DDPDFK BL's Stage 5 with B-Strong. I've gotten the first half down, but the second half is giving me a lot of trouble. The Boss is quite easy to beat without dying, though. 1)No points for absorbing bullets. Even 1 point per bullet would have been nice. Feels very un-Yagawa-like as-is. 2)No points for hitting enemies/bosses with your shot. This is a big problem for me, it just feels off. Again, very un-Yagawa-like. 3)I don't like the shield being active in front of you as you shoot. You can just plow through everything without much worries, until you meet the bullet types you can destroy with your shot. 4)Too easy, due to 3). 5)No variety of items to pick up other than roses on the ground and small roses from cancelled bullets. 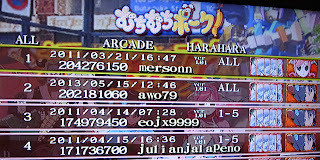 2)Decent scoring system based on timed chains and a maximum x64 multiplier. 3)No real rank management needed (like MMP). So it's a mixed bag for me. The little problems really bug me, and sap the enjoyment out of the game as I'm playing. Yagawa didn't program this Arrange, and it shows. I decided to give Rafute another credit in Ver 1.01 today, and nearly reached my goal of 400+mil with a score of 395,134,670. I got 194mil in the first loop, which is the first time I've scored so high with Rafute, but I also had a double chain break (where the chain breaks to the 1,000 medal value, you immediately accidentally die as the last 1,000 medal is falling off the screen, and your chain breaks again down to the 100 medal value) in Stage 5, which is the first time I think that's ever happened to me. I actually laughed out loud when it happened, and reached for the reset button, but then I thought, "what the heck, I'll keep playing". I'm glad I did. Thankfully the double chain break occurred toward the end of Stage 5 in a section that I get no more than 2~3 million from usually, and I had the medal value back up to 10K for the final curtain section before the boss. There were some other errors here and there so I should be able to do 200+mil in the first loop with her, eventually. On a brighter note, I did not have any chain breaks in the second loop, and I think that's the first time I've done that as well! So this run was full of "firsts", most good, but one pretty bad. I only had time for one credit today, so I decided to try out Harahara mode in Ver 1.01 with Ikuo. It was my first credit with Ikuo in the mode, and I got a clear with a score of 202,181,060, which was good enough for the #1 spot on the Xbox live rankings with Ikuo. I had two chain breaks and did nearly zero boss milking because it's so risky, but I think I can start to try and implement more of it in future runs. Particularly the stage 1 and 4 bosses. With that in mind, I'm setting my next goal at 210+mil, which would give me the top spot on the Xbox live rankings among all character types. If I play this a good amount and discover some safe patterns for boss milking, I'll probably go back to regular Ver 1.01 and do some more 2-Loop runs and try and improve my Ikuo score to 430+mil.